This has been a topic of much debate - not so much the talk of the town as the whisper in the village - this year. Wingfield appears to be perfectly positioned for high-speed broadband. And by that we mean perfectly positioned to be just beyond the reach of any technology from any direction. We’re surrounded by G.Fast, 4G - you name it, it’s all here… just over the other side of that field. A straw poll in early 2016 showed that connection speeds peak at just over 4Mb and spiral downwards to firmly sub-1Mb. BT are rumoured to be providing G.Fast to one edge of the village from Fressingfield and the other edge of the village from Stradbroke, leaving the densely populated centre - a very relative term - stuck with no hope of improvement. The age and condition of the infrastructure being used to serve the Parish should be an embarrassment to its owner, but sadly BT seem immune to such emotion when it comes to using aluminium cables that date from the early 70s. If anyone has any ideas about how to move Stradbroke Exchange closer to Wingfield - 500 metres would do it - then you’d be very welcome at the next meeting. 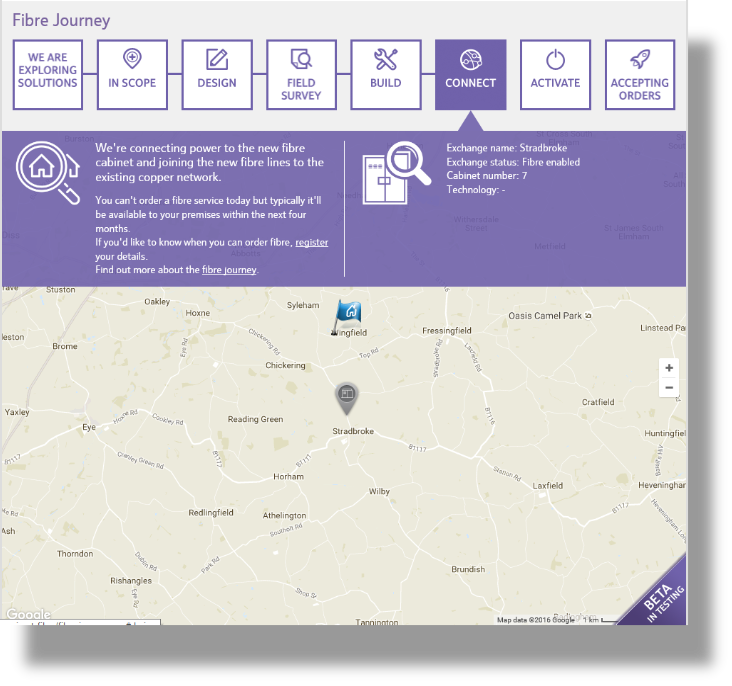 The BT Openreach website suddenly has some exciting news for those living in the centre of Wingfield - the area is being connected for both FTTP (fibre to the premises) and FTTC (fibre to the cabinet) services and should be live and taking orders “within four months” (this statement is now at least nine months old). Coverage seems rather more complete than the project was originally expected to deliver. You can check your own address or landline number by using this link to go to the relevant Openreach page and hopefully you’ll be somewhere in the last four of the process stage boxes. 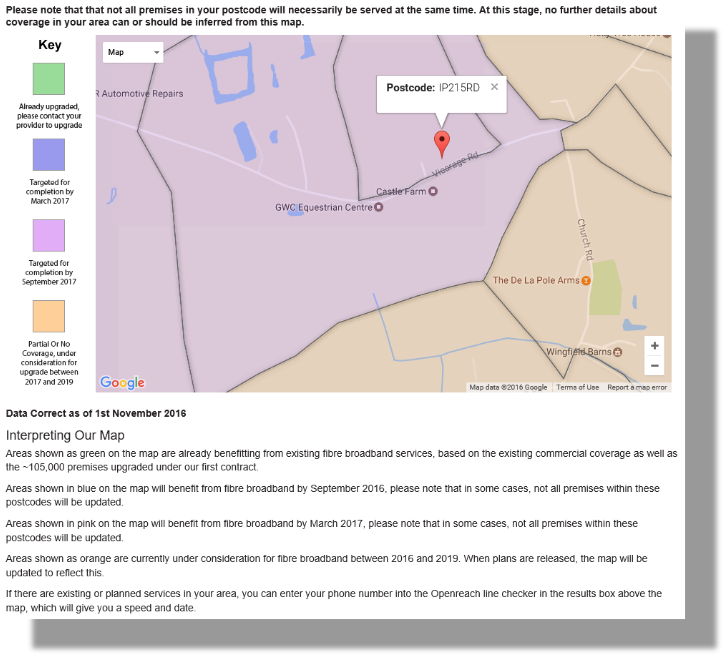 Stolen shamelessly from the Better Broadband for Suffolk site on 10th December 2016 (you can use the link here and do a search on your own postcode or landline number), the map above shows the good and bad news. You definitely want to be in the pink. Unfortunately a lot of the village isn’t. Your hue depends upon geography and that, annoyingly, is rather intransigent - unless you’re working in glacial time. Dan Poulter (MP) has released a survey requesting information. How useful this will be probably depends upon your opinion of MPs, but in any case it can be found HERE. Seems genuine... particularly the bit about the dragons. Progress? 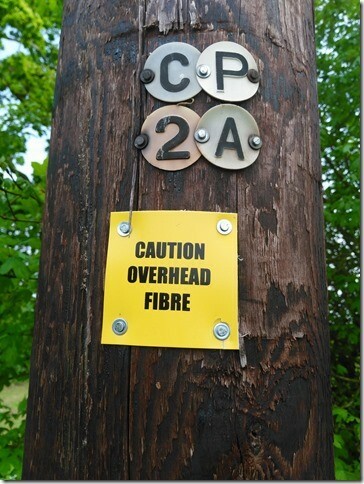 Coils of fibre dropwire and associated signage (shown below) have suddenly appeared on poles located at Wingfield Green and Vicarage Road, suggesting that the long-promised installation phase has started - although the BT site is still quoting "within four months" and BBS's site still quotes completion by September. FAME OR INFAME? 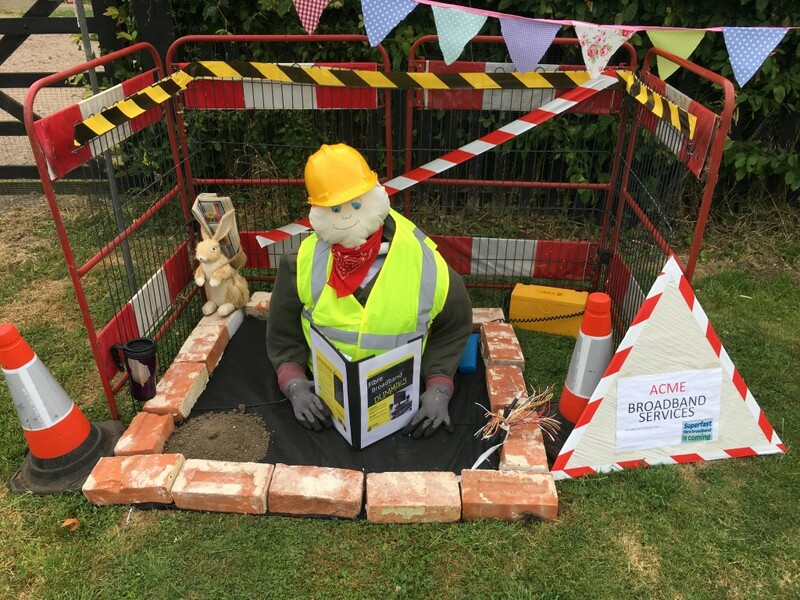 The subject even made it to the Open Gardens' scarecrow competition in June. Openreach and their contractors have been visibly busy in recent weeks, but the Openreach and BBBFS sites haven't changed as regards dates. (According to BT, it's all due within three months - and has been for a year. According to BBBFS, half of us are due the new service this week.) 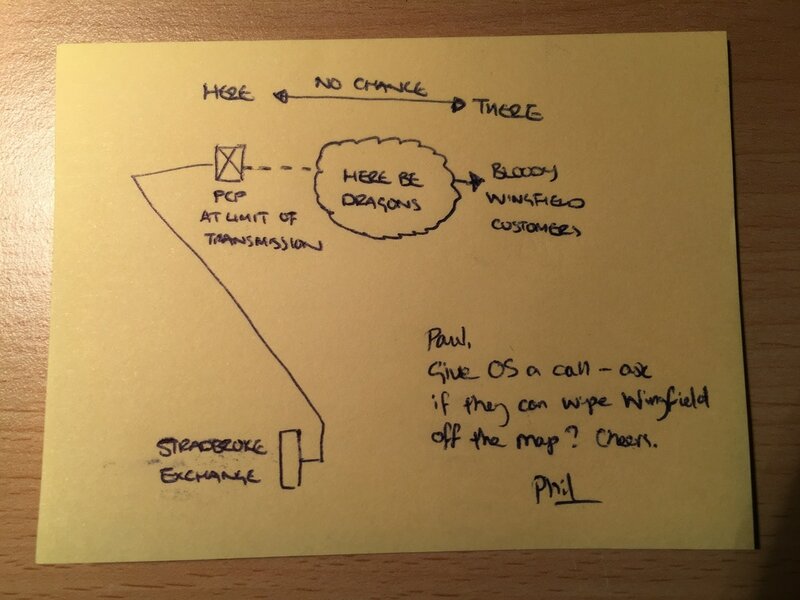 However, by playing with various postcodes and addresses it's possible to get some sort of picture as to who's due to get what - and it appears that the presence of overhead powerlines is an issue (see notes below). In postcode order, those properties in IP21 5RA (Church Road) appear to be slated for FTTP (fibre to the premises), which is the fastest service... but there's no date other than "in five months". Since Church Road is the longest geographic run, this is a hopeful sign for everyone else. For IP21 5RB (Vicarage Road excluding Castle Crescent) and IP21 5RD (Castle Crescent) it's a combination of FTTP "in five months" or FTTC (fibre to the cabinet) "in three months". If your existing service is flown via an electricity pole then it will be a relatively slower FTTC connection. It will be the case that two adjacent properties will have very different connection speeds. For example, No. 9 Castle Crescent is slated for the faster FTTP service whilst No. 10 will have the lesser FTTC connection. IP21 5RE (Wingfield Green and up as far as Castle Farm) has the same scenario. IP21 5RG (beyond Goulders Farm up to Beech Farm) seems to be set entirely for FTTP service with the "five month" lead time. IP21 5QZ (blow the alphabet!) covers Church Road beyond Wingfield Barns up as far as St Martin's Farm. Like the northern end of Church Road, this area appears due for FTTP in five months. The lead-time aside, this is a huge improvement on the earlier plan, that suggested that this area was not going to get anything. FTTP offers speeds of up to 330Mbps, which Openreach have promised to increase to 1Gbps. FTTC offers speeds of 80Mbps for distances up to 500m from the cabinet, down to 28Mbps at the maximum 1Km distance. Clearly a huge drop from the FTTP speed - but also a huge step up from anything that ADSL can ever offer. The issue with electricity poles is because a lot of existing overhead telephone wires are flown from electricity poles. This never used to be a problem, but more recently the privatised utility companies don't help each other out like they used to. Where BT have a licence to use an electricity pole, they are no longer allowed to add additional wires, only to replace them on a maintenance and renewal basis. Therefore if your existing telephone service is flown in via an electricity pole, BT cannot fly in the additional fibre dropwire for the new broadband service. Instead, they have to supply you from the cabinet using your existing copper dropwire. Even if your service is underground, you may still get a FTTC connection if the route between you and the cabinet is flown via electricity poles at any point – and in rural areas that’s always a possibility. Check for yourself - use the BT site quoting your phone number. The current map from BBBFS - some significant changes since the last screenshot taken in December. DECEMBER 2017 - AT LAST! Whilst this needs to be read in conjunction with the postcode findings above, the FTTC system has gone live, BT are taking orders and delivery dates appear to be on an 8-day lead time. As predicted, customers due to have FTTP are still not at that stage, but will ulimately get a much faster service. If BT's predictions hold up then the fact that FTTC services are live in mid-December means that - hopefully - the FTTP service will be live by mid-February. So what's on offer? Webslave has just been offered a guaranteed minimum download speed of 40Mb with an expected variation of 43-55Mb. Every property will vary, but those figures should be a good indication. The degree of variation by chosen supplier should be quite small, so your choice will be driven by who you trust and how much you're prepared to pay. FESTIVE WARNING: Beware of bit-rate envy. The first wave of orders and fulfilled FTTC orders have started to occur. Webslave is now working on a download / upload connection of 55Mb / 10Mb (compared to the prior ADSL 3.4Mb / 0.4Mb connection) and feeling very smug about it, a connection which is very firmly inside the government’s specification of Superfast and slightly above BT’s own estimate. As of early January, much of the FTTP roll-out has gone live too, so those who were waiting longest will find themselves getting the most - hopefully at least 300Mb, and at least two weeks earlier than expected. In all fairness, although the wait has been frustrating, long and officially ill-informed, the end result is that BT have undertaken a much wider and far-reaching roll-out than was originally envisaged (or even possible when the project was originally financed). Two years ago no-one in Wingfield had anything above 4Mb. Many were firmly sub-1Mb. As things stand exactly two years later with the roll-out almost completed, no-one should be under 30Mb, some will be over 300Mb. Worth waiting for? Yes – but only once you have it! As a footnote, some of the conversations with infomed people have hinted that the quality of the some of the work undertaken for BT may not quite what BT would have hoped - and paid - for. Acceptance testing only tests the transmission abilites of the network, not the way the network has been physically installed. It will be interesting to hear about the fault rate as the network ages and wind, water and sun do their things. But that is, hopefully, still a long way off.